Paintings using tissue paper and paint. Vendors and a busy booth. The annual One Of A Kind Craft Show is officially underway and has taken over Exhibition Place. Saturday Nov. 24 was the biggest day in the show. Visitors could take in fashion shows, performances, and contests along with 800 vendors showcasing their unique work. Every year the number of attendees increases. This year more than 150,000 people attended the event to view artisan created pieces and shop their favourite collectibles. The One Of A Kind Craft Sale started in 1975 and it was originally just a winter craft show. Fast forward to 1979 and they added a spring show because of the popularity of the winter event. As of next year it will be 50 years of the show and it keeps growing every year. The show provides a platform for artisans to showcase their artwork, food, and handmade crafts. This seems to be a very popular market for those looking for unusual finds. Walking down aisles A-Z you will find different booths with each vendor displaying their work. All items are available for purchase in the booth or online and will come with a certificate of authenticity for the one of a kind item. Vendors pay about $3,500 for a spot in the show with additional costs for the build of their booth and additional requests. 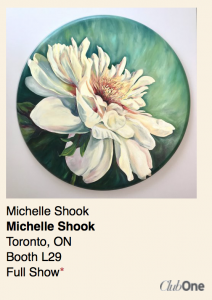 Michelle Shook was one of the vendors displaying her paintings in the show. 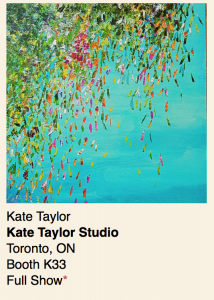 “I have always been a fan of the One Of A Kind Craft Show, and it is so fun to be here. It’s nice to be appreciated for my hard work, and it’s cool to meet other people who are being appreciated for theirs. You spend endless hours working on pieces that mean so much to you, so to have an entire convention centre filled with people wanting to look at those pieces is so cool,” Shook said. She also went on to talk about her paintings. 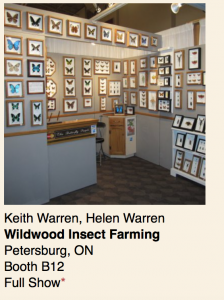 Another booth showcased the work of Keith and Helen Warren from Wildwood Insect Farming. “We have always been praised for our unique and slightly odd work. People don’t know whether they like it, or if they want to look away. We have always loved and appreciated insects, and like them even more when we can see them for their beauty and see them up close, it’s a weird interest I guess,” they laughed. “It’s interesting to see how our interest can wind us up here at the show,” Helen added. Although their framed insects have an eerie edge to them, it was a very popular booth. There were many visitors interested in seeing these insects up close and personal, and were intrigued by the macabre feel. 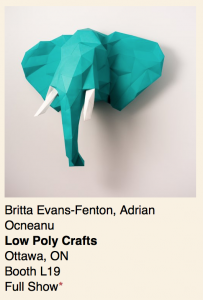 Other artisans featured in the show include Low Poly Crafts, Kate Taylor, and Creations d’Octobre. Another section of the show were the aisles of food. Delicious unique creations displayed and ready for tasting took to the booths to attract those with both a savoury and sweet tooth. Blueberry and cream cotton candy, sweet chilli chocolate bark, roasted duck, and a number of different cocktails were all a part of a mouthwatering experience for those in attendance. One of the most popular booths in the food isle was Tealish. 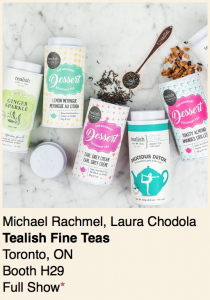 Michael Rachmel, and Laura Chodola are the founders of Tealish and have been vendors at the OOAK for the past three years. “We love the atmosphere, the people, the ability we are given to network, it’s really fun, we love interacting with the guests and other vendors. We work hard on our teas so to see guests love it means alot,” Chodola said. “The show gives you so many ways to stimulate your five senses,” Chodola said. 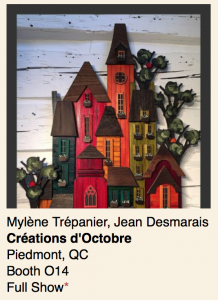 With all ages welcome, and with Christmas coming up, enjoy a day out with the family and visit the One Of A Kind Craft Show, running until Dec. 2. 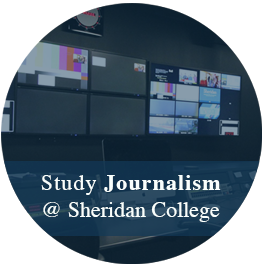 Alex Frisby, first year journalism student at Sheridan College. She enjoys reading, writing, and music.